The forest plays a significant role in the life of the indigenous communities. It is where they get food, materials for shelter, and sources of livelihood. They need to learn how to sustain their resources not only for the present but also for the generations to come. In pursuing sustainable living, the youth volunteers under the forest management group are already in the process of managing resources in a way that sustains the forest. The group has bagged 622 giant bamboo or buntung cuttings. This is one way of making sure that we do not run out of bamboo because of its many uses. There are three techniques in bamboo planting: bagging, bedding, and direct planting. However, the technique that gives most successful bamboo growth is the combination of direct planting of cuttings followed by bagged cutting that are well-rooted which can be used to fill in for those cuttings that were planted directly but did not take root. 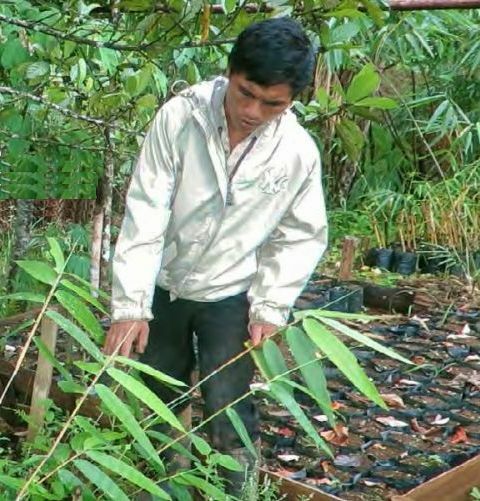 When a bamboo is bagged and placed in a nursery, it is given ample time to root and establish a good growth before it is transferred to the forest edge where it also acts as a buffer. The time in the nursery usually takes eight months and during this time, the bamboo is watered and maintained. Only those that are healthy enough are transplanted. As soon as they are transferred, watering is twice a week when there is no rain. As of the moment, balakanas, dalamuan, buntung and kawayan tinik (a species of bamboo that does not naturally grow in Upper Pulangi) were bagged and are now cared for at the nursery. With every bag of bamboo comes the hope that it will grow healthy not only to produce good quality bamboo for construction but also to protect the forest from degradation and soil erosion, so that the generation to come will experience the beauty and bounty of the uplands.